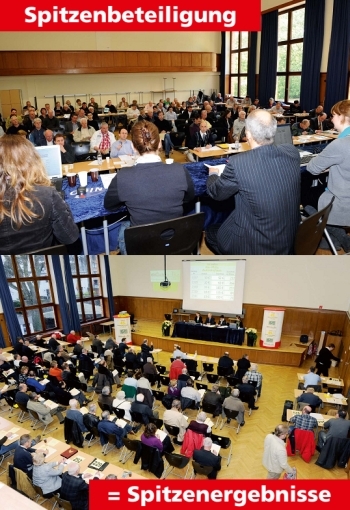 AIX-PHILA's stamp and coin auctions, which are held every spring and autumn, combine their role as a philatelic and numismatic marketplace with the features of a special event. 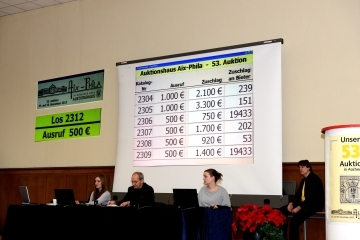 Bidders hold their breath while they watch spectacular increases in price. A large screen shows photos of the stamps or coins as well as the sales results, thus providing the relevant information for everyone as well as the desired transparency for sellers and buyers. For anyone who goes to the nearby cafeteria for a break, there is a special link which constantly relays information on what is happening in the auction room. Efficient networking of data and the long-standing experience of the auction team ensure that things run quickly and smoothly, thereby eliminating inconvenient waiting times for customers. 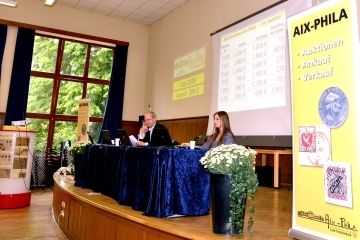 The above-average quota of sales achieved in each auction is not only due to the established commission agents and thousands of written bidders worldwide, but above all due to the many bidders present in the auction room, who make AIX-PHILA auctions among the best-attended auctions in Germany. And naturally this is also to the benefit of sellers, who are guaranteed high returns as a result of competition between all the bidders.